Souvenir cloth pennant, banner, flag from Bangkok Thailand. Dates between 1950s to 1960s. Part of a vintage collection purchased at an estate sale. 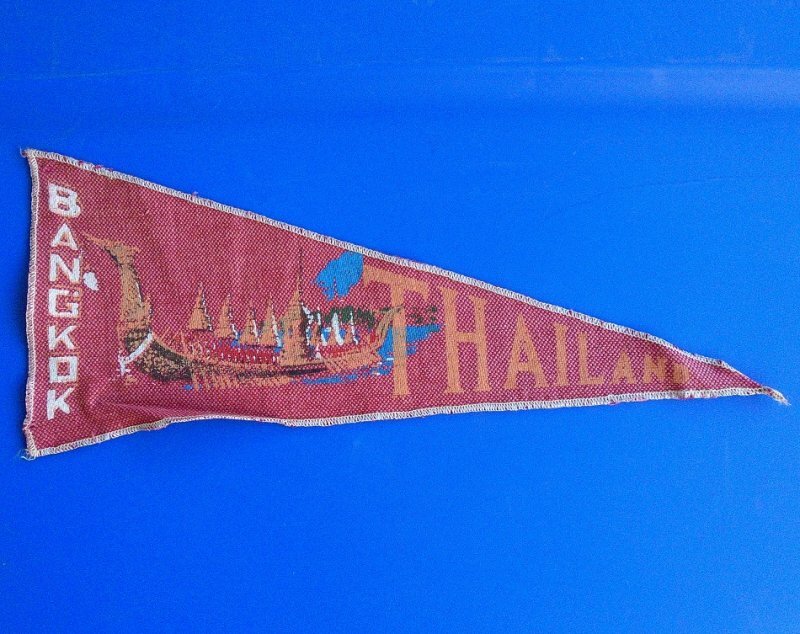 This listing is for the Bangkok Thailand pennant that you see in my photo. It is made of a lightweight tweed cloth material. Vertically on the left side it measures 6.25 inches long. Horizontally, from the far left corners to the pointed tip on the right it measures 15 inches. There are no ribbons or slots to hang it by, so it would have to be either framed, or tacked. There is stitching all around. In several places I see a loose thread, but I don't see any broken stitches. The coloring is still very strong and vibrant. On the left side by the letter N in Bangkok, you can see where a spot of material rubbed off. This area is about 1/4 inch in size and can be seen in my photo. Also, it will need to be pressed. Delivery will be via USPS First Class Mail Parcel from California. To mail it, I will probably just lay the pointed end over lightly and use a padded envelope. Buyer to pay delivery charges of $3.99.